I was going to make Rhubarb Muffins, but then thought I'd try something different. So I searched Pinterest for Rhubarb Bread recipes. There were several that looked delicious, but I settled on this one from Hoot-n-Nanny. The oatmeal on top was what sold me. 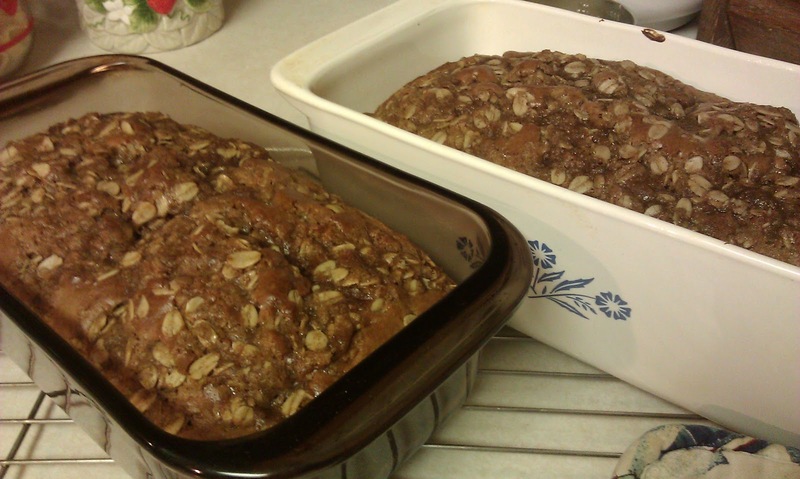 I cut down the sugar and oil just a bit and used some white whole wheat flour. Preheat oven to 325°. While oven heats, place butter for topping in an oven-proof mixing bowl and place it in the oven to melt. In a large bowl, mix together egg, oil and 1 cup brown sugar. Stir in soured milk and vanilla. Combine flour, salt and baking soda and cinnamon and stir into sugar mixture until combined. Fold in rhubarb. Pour batter into two lightly greased 9x5 inch loaf pans. Remove bowl with melted butter from the oven and add the rest of topping ingredients. Sprinkle over the unbaked loaves. Bake in a preheated oven for 45-50 minutes, until a toothpick inserted into center comes out clean. Cool on wire rack 10 minutes then remove from pans. * to make soured milk, put 1 T vinegar or lemon juice into measuring cup; add milk to make 1 cup, stirring to combine, and let sit for a few minutes at room temperature. I used 1-1/2 cups white whole wheat flour and 1 cup unbleached flour. I buy the Wheat Montana Prairie Gold flour at Walmart. It's made from hard white spring wheat and finely ground so it's lighter than traditional whole wheat flour but still has all the whole grain benefits. I think traditional whole wheat flour would add a bit more flavor and texture to this, but I'd probably switch the measurements and use only 1 cup of whole wheat and 1-1/2 cups unbleached. I might add a tablespoon of ground flaxseed for flavor, too. Other than that, I don't think I'd change a thing about this bread. 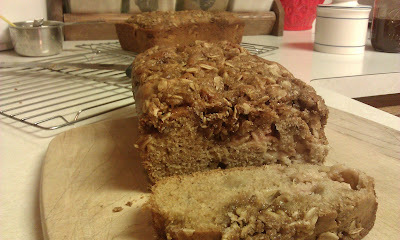 It's really good, and I especially like the brown sugar and oat mixture on the top. It kind of bakes down into the bread in places and gives it a kinda of crunchy/gooey bite, and it's yummy. It does make the bread a bit crumbly, so it's best to use a plate when eating this - or stand over the kitchen sink, so you don't make a mess. Update: I had to make the Honey Rhubarb Butter. 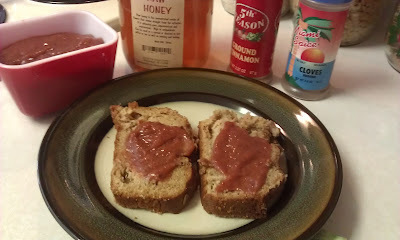 I used 1 package of frozen rhubarb (2 cups, mostly thawed), 2 T water, about 3 T raw honey, 1 tsp. cinnamon, and 1/2 tsp. cloves. I cooked the rhubarb and water until mushy then stirred in the honey and spices. I did not blend it because it didn't seem to need any blending. It's really good on the rhubarb bread, and I think it will be really good on other things like toast and biscuits. I'm thinking I'll cut the cloves in half and only use 1/4 teaspoon next time, because they're a bit strong - not bad, really; I just think I'll like it better with less.